This week's word is exhale. For me, the word exhale goes with breathe. To breathe is to inhale and exhale. 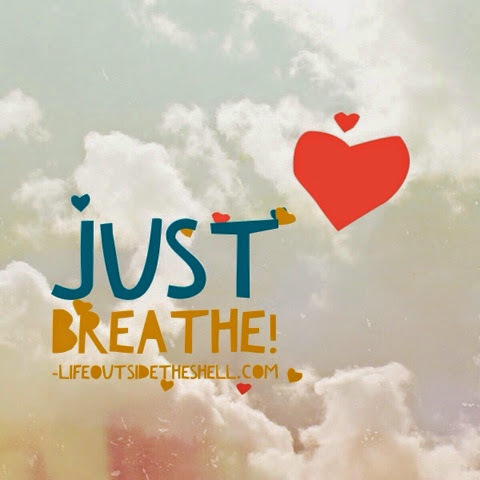 As a group fitness instructor one of my most commonly used phrases is "just breathe!". Why? Because when the going gets tough I look out and see my class holding their breath. It's as though they think that holding their breath will give them more energy. But nothing could be further from the truth. When we hold our breath it actually makes us weaker because we aren't getting oxygen to our muscles and brain thus causing us to grow weak, light-headed and in extreme cases pass out. This is so parallel to our spiritual lives. If we hold our breath, that is forgetting to inhale the word of God and exhale with praise and thanksgiving to Him, we grow weak. We think we are saving time by not having that quiet time but in reality we are just weaking ourselves for what lies ahead. My 5 minutes is up! :) Make it a great day! That's true. We think we're saving time by not having quiet time, but we're not. Thanks for this encouragement to just breathe. Erika thanks for the reminder of how quiet time should be natural as inhaling God. Thanks for sharing- interesting link of breathing in the word of God, definitely a good reminder! Happy Friday! Yes, breathing in the Word of God - perfect!